To paint with light–that is what photographers do. That idea, a way to reshape the way I look at the world, is the one nugget that’s stayed with me all these years since I was first studying photography. Fast forward from the late 1990s to the present, I’ve been switching from film to digital this year as I relearn the art of SLR photography. Although technology has evolved, film has become a niche, and time has clouded much of what I learned back then, one thing is still the same: the science of light and the way it wraps around an object, enveloping it with its invisible yet transformative qualities. Armed with a new DSLR camera and taking workshops here and there, my eyes are being reopened to the beauty of the world around me–in particular, the beauty of food. Just take a look at a bunch of radishes, their magenta skin glowing and contrasting with the green leaves. Exact opposites on the color wheel. Nature. Art. When food is this pretty in its raw, whole form, it deserves to retain its dignity when integrated into a dish. 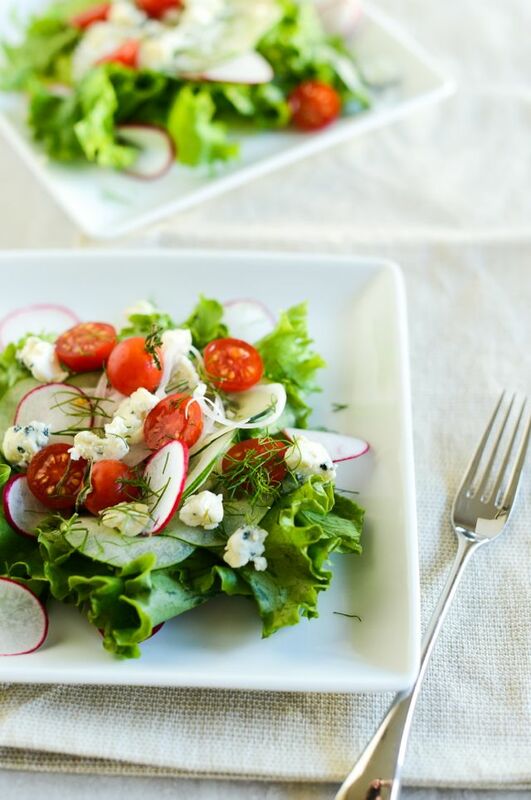 That’s one of the things I love about this Danish blue cheese salad. Isn’t it pretty? 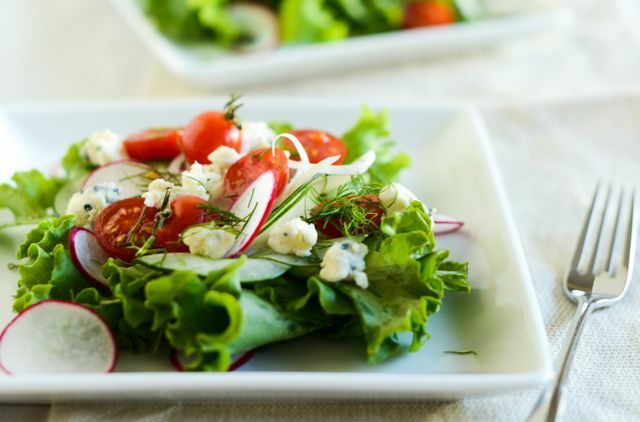 On a bed of curly lettuce, thinly-sliced cucumbers and radishes nestle together with sliced cherry tomatoes, a trace of shaved onion, fresh dill, and crumbled blue cheese. It’s so simple there’s almost nothing to it. The dressing–oil and vinegar accented with a little mustard, salt, and sugar–highlights the salad’s flavors without drawing attention to itself. Crisp, fresh, summery. No one ingredient dominant, except perhaps the blue cheese with its pungent pop of flavor. Just right. Of course, presentation is important–ingredients this beautiful want to be dressed up, allowed to shine. In some regards, photography has been reminding me about how lucky we are to have access to so much good food. Quality, whole ingredients–radishes, tomatoes, artichokes, you name it–possess a special beauty that their canned and frozen counterparts lack. As I’ve been studying photography and applying what I’m learning to my own work, I’ve been reflecting on the luxury that living in Seattle provides; as I mentioned the other day, the city has a multitude of farmers markets, some of which operate year-round, and it’s no problem to find grocery stores stocking quality, whole, organic items. Eating well is easy. Circling back to the idea of painting with light, consider that the next time you sit down to eat something fresh. Look at the reflections and shadows, the range of colors and textures, and how they all work together to create something beautiful. See if taking the visual nature of food into account doesn’t somehow elevate its taste. It sure does for me. Adapting a recipe from Scandinavian Feasts by Beatrice Ojakangas, I added dill and tomatoes, giving it an extra special summery touch. I resisted the urge to swap the canola oil and white wine vinegar with more special versions; I’m glad I did, as the resulting salad is just right. 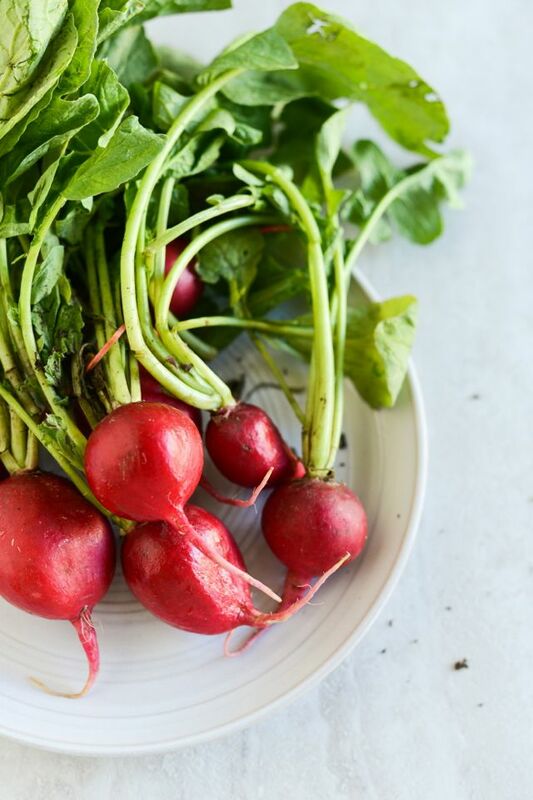 Prepare the salad ingredients and place them in individual prep bowls: Wash and dry the lettuce then tear roughly into pieces; thinly slice radishes, cucumbers, and onion with a mandoline; cut tomatoes in half; and roughly chop dill. To make the dressing, combine vinegar, mustard, salt, and sugar in a small bowl. Slowly pour the oil into the vinegar while whisking, allowing the ingredients to combine. 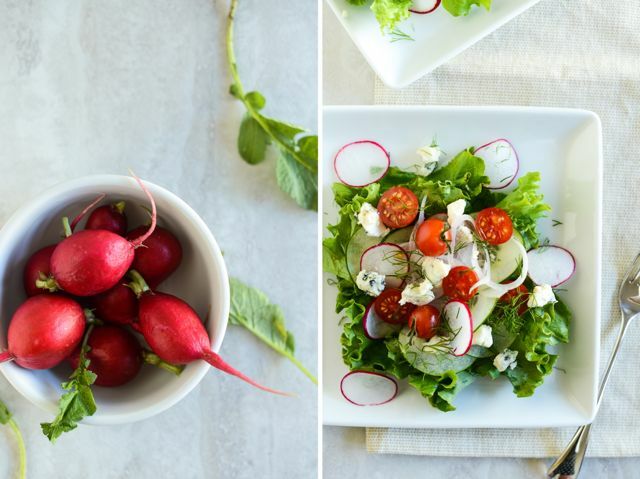 Assemble the salads by dividing the lettuce between six plates and topping with radish and cucumber slices. Place a little sliced onion on the top of each salad, then arrange tomato halves around. 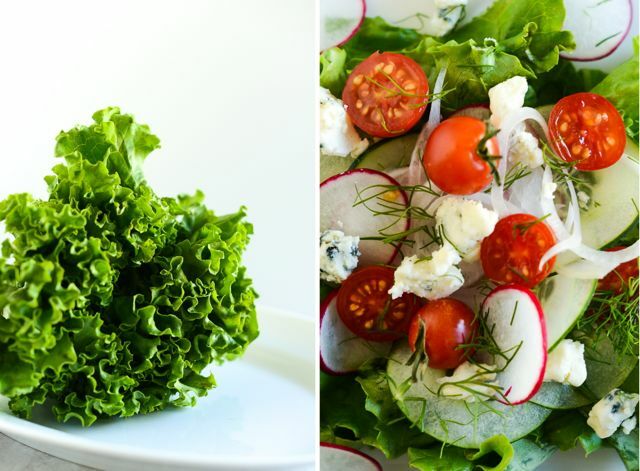 Scatter blue cheese and dill over each salad. Just before serving, spoon the dressing over each salad. Top with a little freshly-ground black pepper if desired.